I approach my little textile pictures as I would decorate a room- The stripping back, the preparation of the surfaces are crucial, then comes the decoration, the final touches. So I source old cloth, dye it with tea or coffee, paint it or distress it in some way first. Background colours make such a difference. I have a stash of coloured backgrounds, already cut and ready to rock. Sometimes I favour a muted neutral colour where I could use blended tones in the foreground, other times I feel a bit braver and dive right in with a bright bright colour when I know everything on top needs to be contrasting but equally bright in order to work. Then there’s the layering of the foreground- Ive written about that in a previous blog ( How do we find our own style), so wont linger on that one. Suffice to say, I play with patterns and plains, solids and see throughs, flat and texture and that biggie- colour. I spent years teaching about the colour wheel and giving youngsters ample opportunities to create different effects whilst adhering to certain rules. Always fun to do, and I never tire of experimenting with mixing and matching shades and tones. What sort of world would it be if we didnt have colour? Then, there’s the final stage – the stitching on top of the layers on top of the background fabric. Which stitch? Which colour? Which tone? Where? How many strands? I dont have hard and fast rules about stitching really. I have just learned to use different thickness threads and again, play. 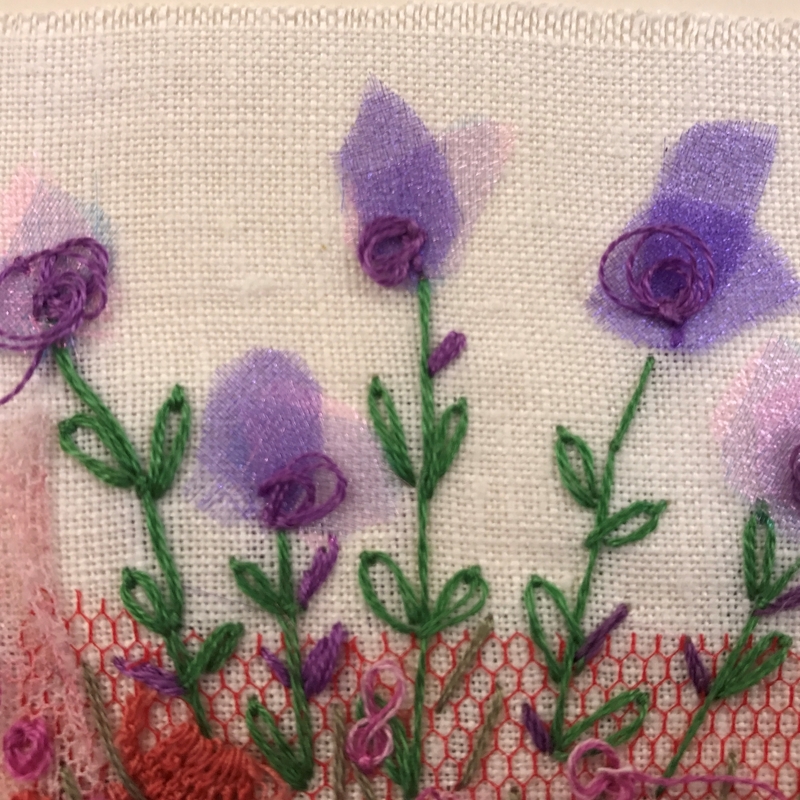 I do have favourite stitches which come out again and again and I never get tired of them because they always seem to work. Ive recently made a stitched sampler using various stitches in a much more formal way (picture at top of the page). I loved making it but doubt that those more uniform stitches would creep into my work anytime soon. So lets start with Bullion Knot. An all time favourite- great for delphinium lookalikes. Usually I use 3 strands of thread as I find any less and it needs more wrapping. 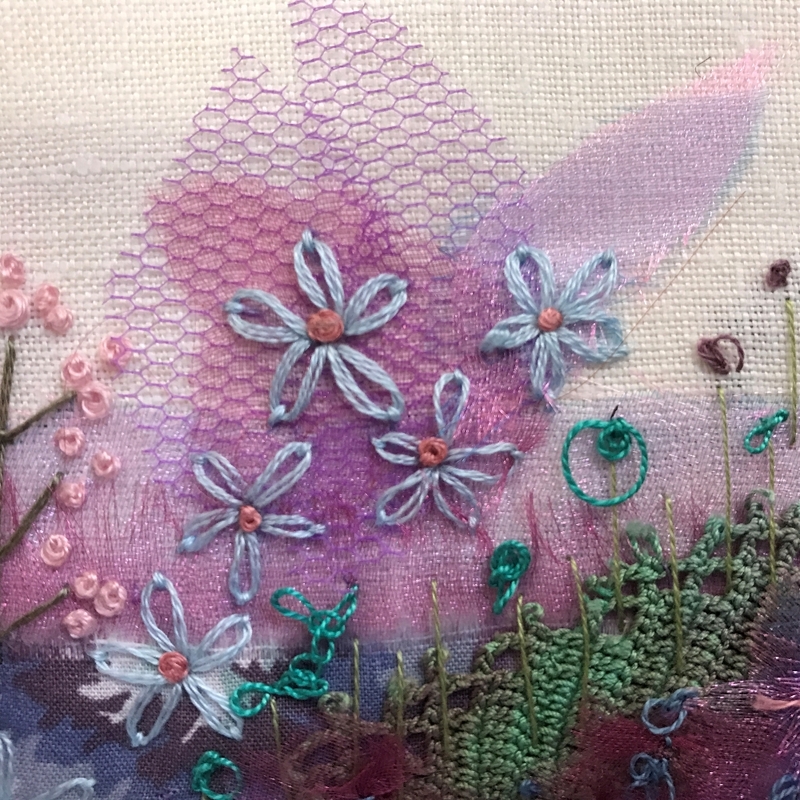 My golden rules for this stitch are to firstly use a longer needle with a thin eye and secondly, don’t wrap the threads too tightly round the needle. They should slip off quite easily- if it becomes a battle, then change something. Lazy Daisy stitch is an absolute favourite of mine. Sometimes I add a french knot in the centre, sometimes a bead-always a contrasting colour for a bit of bling. Usually I use 3 strands, sometimes 2 depending on the scale of the piece. Easy and quick to do as well, but always cheerful wherever its plonked! 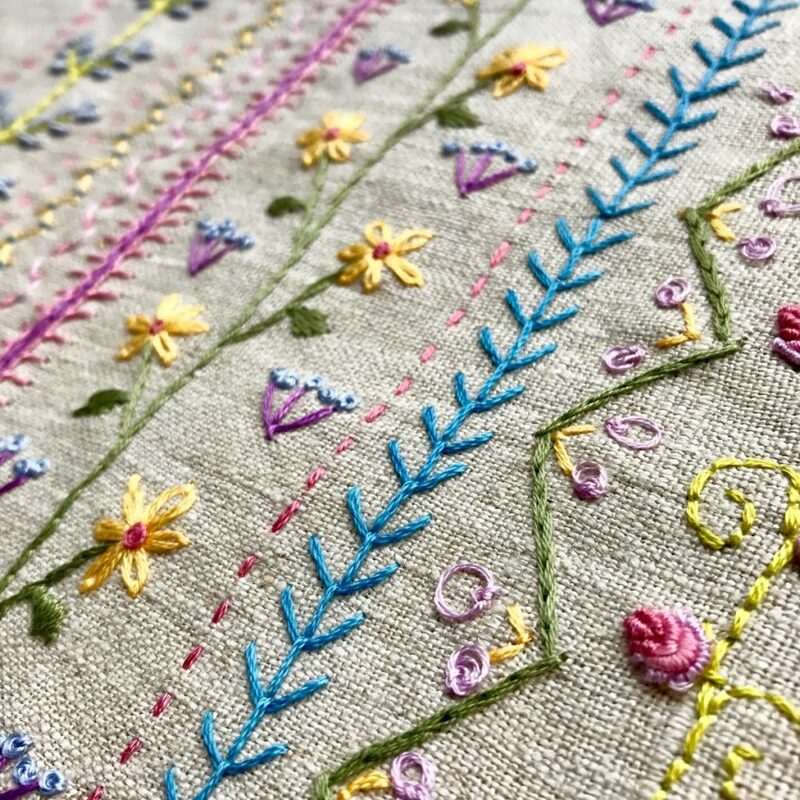 Fly Stitch is another trusted friend- can be any size, any scale, any thickness but great for filling a space in between flowers. Easy to do, you sort of get into a rhythm and just go with it. 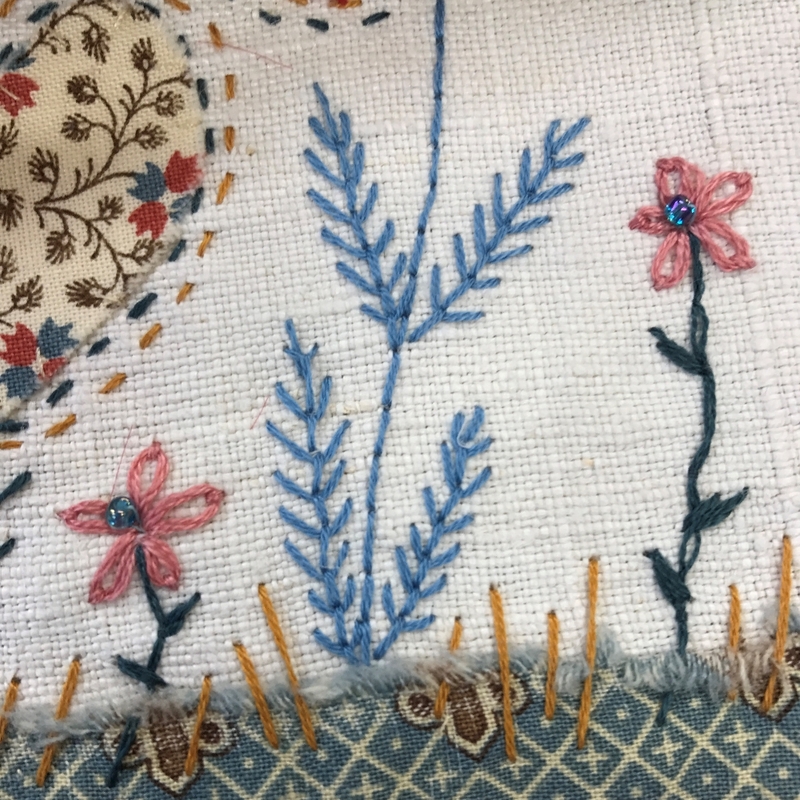 Another stitch which I find really useful and versatile is what I call- Wibbly Wobbly french knot. 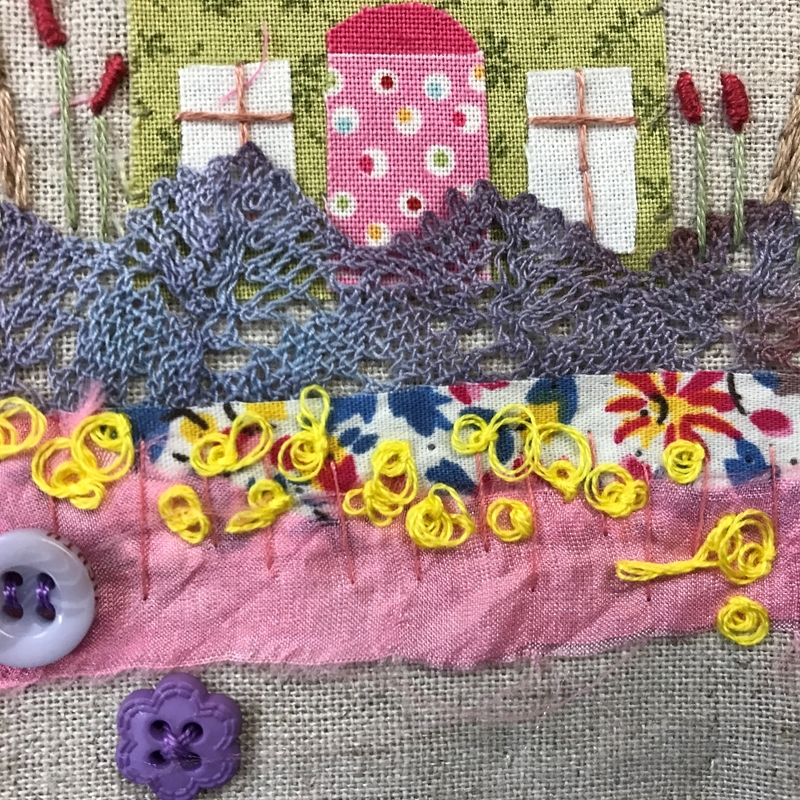 All that means is that it’s exactly like a normal french knot except that you don’t pull it tight- leave 1-2cm thread so that each time you make a stitch, you get a bobbly effect. I tend to alternate between 2, 3 or 4 wraps to create a more varied texture. My final fave is made using organza. 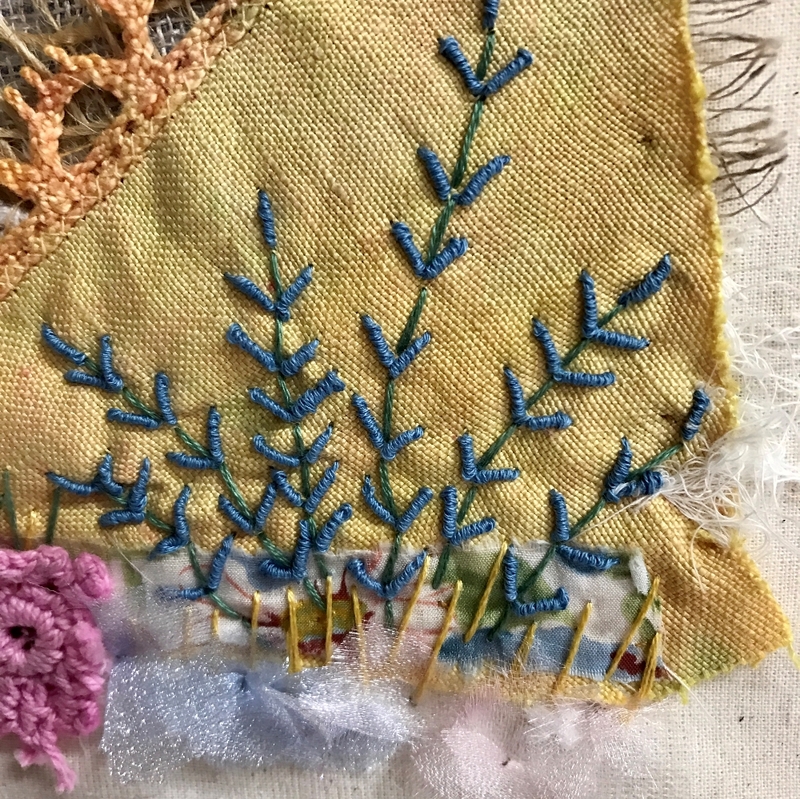 I tend to cut small circles or ovals or irregular shapes, pin them in place, often haphazardly overlapping 2 or 3 pieces then catch them down in the middle with a bead, french knot or wibbly wobbly french knot. This can create some lovely whimsical looking flowers and just gives an impression rather than a solid stitched flower. There are so many more I could mention. But these are my must haves. Happy playing, sometimes the nicest effects are the happy accidents, so just have fun with them and do share anytime!